Produced by TAD Management. Universally regarded as one of Rock and Roll's finest and most versatile entertainers, Peter Noone is second to none! Star of stage, screen and record, Noone's performances are the stuff of legend's deftly delivering a broad palette of music, all gems that, through his voice, defined a generation. 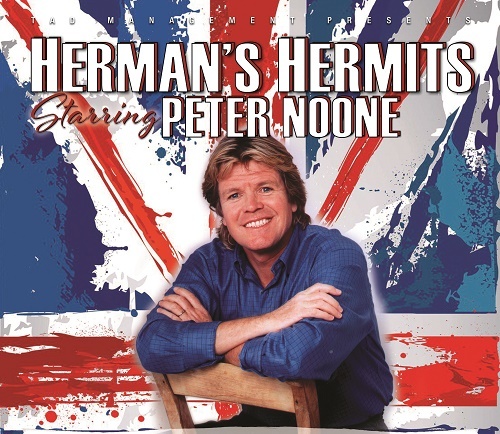 Herman's Hermits starring Peter Noone is a must-see concert experience. Rock's premiere raconteur packs plenty of puns but pulls no punches with his music. Peter Noone is the real deal. Over 60 million records sold! 20 top 40 Hits including: "I'm Henry VIII, I Am," "Mrs. Brown You've Got A Lovely Daughter," "There's A Kind of Hush," "I'm Into Something Good".